Many of us feed our horses and ponies treats as a reward when training, or just because we love them. Treats that are similar to a horse's natural foods are healthiest, but a very small amount of almost any food item horses or humans eat is safe to feed as a treat. There is a safe way to feed treats, so be sure your horse is respectful and doesn't get pushy or nippy. 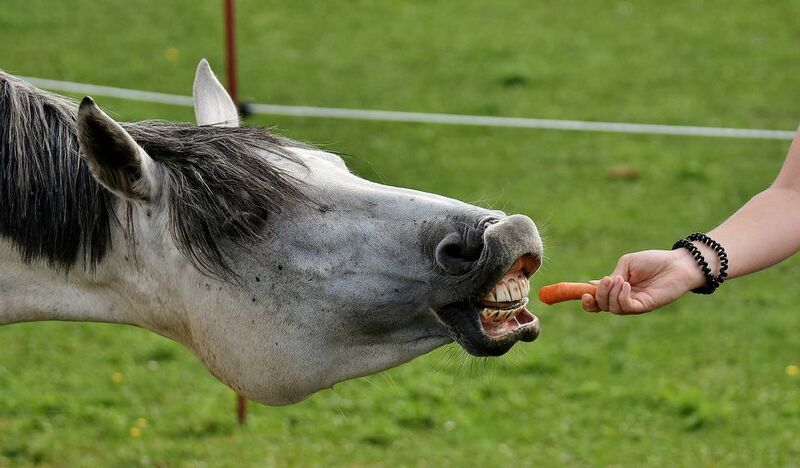 Many horse owners don't believe in feeding treats at all. This is your decision, and you need to take into consideration the respectfulness and personality of your horse or pony. If your horse is at all nippy or has other band ground manners you may decide that the risk of giving your horse treats is too great and that it may make your horse a danger. Horse bites hurt, and especially if little children feed a treat, fingers can get bitten, pockets can be ripped and your horse can mow you down in eagerness. So use your discretion, despite how you personally feel about treat feeding, especially feeding treats by hand. You'll find horses have different tastes too. Some may love peppermints or sugar cubes and some prefer carrots or hay cubes. If you often carry treats in your pockets or feed from your hands you might teach your horse a bad habit. He might decide that all pockets or fingers contain treats and nip at your clothes and fingers. A horse that is pushy about getting treats can be dangerous. It's easy to get bitten or have your clothing ripped by a greedy horse. The safest way to feed treats is to put them in a bucket or feeder. Some treats can be a choking hazard. Apples and carrots are safest to feed cut into pieces. Only feed a very small amount of any hard foods like mints and hay cubes. A greedy horse may not chew the treat completely and bolt it down. The food can then become lodged in the horse's throat, causing choke. In the book, "Arabian Exodus" author Margaret Greely describes the Bedouin custom of feeding horses whole dates. After their meal, the trough would be covered in pits. While swallowing a few date pits might not cause a problem, you'll want to remove the pit or stone of any fruit you feed if it is large enough to cause a choking hazard. Lawn, hedge or garden clippings. Anything from the cole family like broccoli, cabbage leaves, kale or cauliflower. Chocolate, if you are competing can cause a positive drug test. Don't feed treats to a strange horse. The horse could have a medical condition that disallows certain types of food. Some owners don't believe in feeding treats at all. Dispose of food wrappings out of reach of your horse. A bag smelling of sticky peppermints could be ingested and cause a blockage that could be deadly. Horses will eat surprisingly weird foods-from roast beef sandwiches to ice cream. Historically, horses have been fed some strange things to survive--like fish. However, horses are herbivores-animals whose digestive system is geared to digesting grass and soft plant matter. Although some horses can eat these things with no apparent ill effects, it is always better to stick to treats similar to their natural foodstuffs. Learn about foods a horse should not eat.